High cholesterol isn’t just a buzz word thrown around by T.V Doctors on midday filler programs. High cholesterol levels have distinct and powerful links to heart attacks and other heart diseases. Needless to say, if your doctor has notified you of having high cholesterol, then lowering those levels needs to be made a priority. Unfortunately, many many people suffer from high cholesterol. For this reason, there are a number of prescription drugs available. But what if you want to avoid medication? To put it into a visually accessible term, Cholesterol is a wax-like substance. It is not inherently bad in fact it is vital to the production of cells. However, there are two types of cholesterol. 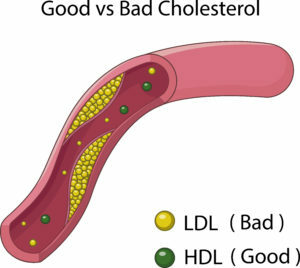 One is bad, LDL (low-density lipids) and the other being good HDL (high-density lipids). Your body naturally produces HDL, it is produced in your liver, and as mentioned is used in cell production. It is also kind of like a vacuum cleaner for LDL. Both of which are constantly in motion in your blood stream. But, LDL (the bad one) is the one which clings to the walls of arteries and veins. Too much built up LDL is what causes heart attacks, stroke and coronary heart disease. 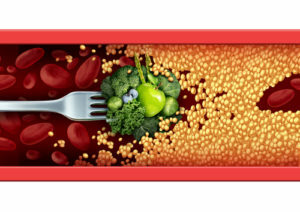 So while your body is naturally producing all the HDL it needs, LDL is accumulated from the food and drinks we consume. So while too much LDL cholesterol can be a really big risk factor for heart disease, its presence can be minimised and controlled. The biggest source of cholesterol which can be fairly simply limited is found in the fat contents of the food we eat. Know as saturated fats, trans fats and dietary cholesterol. Red meat (pork, lamb, beef, goat and veal) is one of the most predominant sources of saturated fats. Along with dairy (even the ‘low-fat’ option), palm oil and coconut oil. With egg yolks and shellfish being contributors of dietary cholesterol. Naturally, anything deep fried or cooked in an excessive amount of oil is also going to contribute high levels of saturated and trans fats. Fibre is your friend! Fibre is proven to help in lowering cholesterol. So find it and eat it, there is no such thing as too much. Fortunately, fibre can be found in a multitude of places. With options such as legumes and beans, they will make sure you are still getting the protein when you cut down on your meat intake. There are also a number of commercial fibre products available on the market. But naturally is always best. The list below is just some of the vegetable and fruit options which are high in soluble fibre as well as protein. So while diet is often a major contributor to high levels of cholesterol, it is also the answer. If you are also chasing a weight loss goal than changing your diet is one the most impactful things you can do. High cholesterol is not just something ‘overweight’ bodies suffer from. Even those seemingly ‘healthy’ body types can also suffer from high cholesterol. Daily exercises are one of the key contributors to helping to reduce weight and cholesterol. Fortunately, though, there is no one cure-all exercises choice. So if it is hitting the gym, the pool or the dance floor that makes you happy, get to it, pump those muscles and get the added benefit of increased endorphins. If you are struggling, why not add a workout plan to your TeaSlim package for a proven and sustainable active lifestyle. If you are going to the effort of changing your diet and increasing your exercise, why not help your body out with TeaSlim. 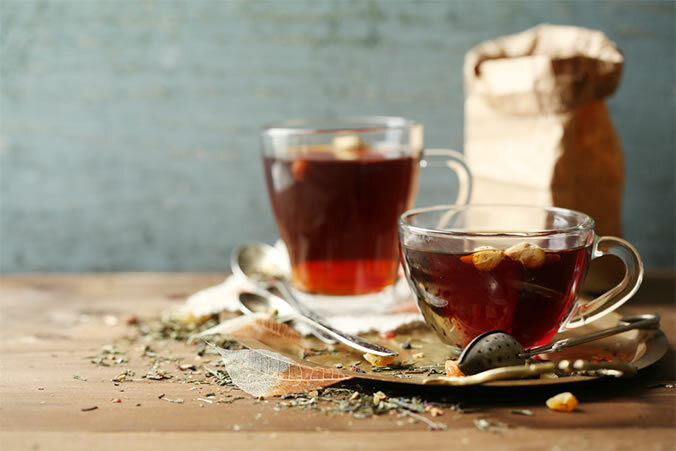 Our range of weight loss teas, coupled with our exercises and meals plans will give you a holistic and proven means to reducing your cholesterol levels.